Cost to install a smoke detector varies greatly by region (and even by zip code). Get free estimates from fire protection experts in your city. Cost to install a smoke detector varies greatly by region (and even by zip code). Get free estimates from fire protection experts in your city. The average cost of installing a smoke detector is $150. How much does it cost to install a smoke detector? According to the National Fire Protection Agency (NFPA), having working smoke detectors 1 in your home cuts your chances of dying in a fire in half. They recommend that each household has smoke detectors on each floor as well as inside each bedroom and outside each sleeping area. To have a new smoke detector hardwired into your home, the average homeowner will spend around $150 total. The exact location of each smoke detector in your home will likely be determined by building codes in your town or state. However, it is generally recommended that you have at least one in the main area of each level of the home as well as one inside each bedroom and one outside each sleeping area. They should not be installed near windows, doors, or ducts, which could interfere with the smoke flow. Ceiling mounts are most recommended because smoke rises. The detector can be installed almost anywhere on the ceiling as long as it is more than 4 inches from a wall. 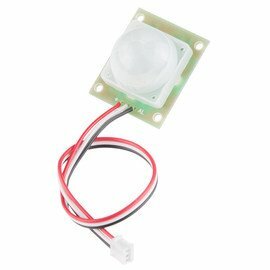 If mounted on a wall, they should be installed roughly 4 inches below the ceiling. Smoke detectors can have one or two power sources. A smoke detector may be battery-operated, meaning that it relies solely on a battery for power. These are the least expensive and easiest to install by simply screwing their bracket into the wall or ceiling. 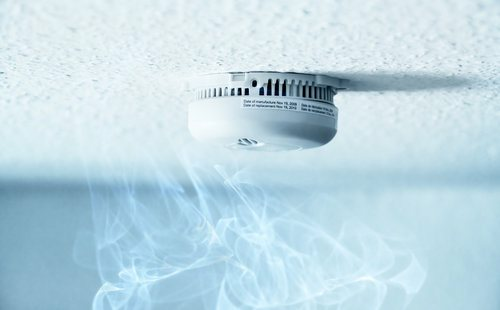 Battery-operated smoke detectors do not interconnect and are more likely to fail, but because they do not rely on electricity, they work regardless of power sources. Smoke detectors may also be hardwired with a battery backup in case of a power outage. Hardwired smoke detectors are linked to your electrical panel and are typically interconnected so that when one sounds, they all sound. This increases the odds of them working properly in the event of a fire. Installation of a smoke detector varies depending on the type. For a battery-powered smoke detector, installation is simple and often carried out either DIY or by the fire department for free. The process involves locating the right location for the detector, marking where the screws will be installed on the backplate, drilling the holes for the anchors, and screwing the plate to the ceiling or wall. The smoke detector itself simply twists and locks to the backplate. If you are replacing an existing smoke detector that is hardwired, the process is also simple. This involves merely removing the old detector and checking to see if the new one uses the same plate. If so, simply plug the wires into the back of the detector and snap it into the plate. If not, remove the old plate, install a new one, then plug in the detector and snap it into the plate. For a new hardwired installation, an electrician will run the cable to the desired area and install an outlet box with the required wires. The technician will connect the wires and ready them for connection to the smoke detector, then install the plate and ensure the detector is functioning properly. On average, electricians charge around $80 to $100 to install a smoke detector, hardwiring it into your system. This charge drops for each additional smoke detector you may want installed in your home, with multiple detectors sometimes only costing $20 to $40 each after the first one is installed at full price. Many people also decide to install carbon monoxide detectors at the same time. You can do this by installing a dual system or a separate unit. The units themselves cost between $10 and $40. Some detectors have lights, which can assist deaf or hard-of-hearing individuals as well as making it easier to find your way outside. These start at around $50 each. You can also find smoke detectors that can be linked to your phone via an app for better control of the system and system testing. Smart detectors start at around $100, and there may be additional monitoring fees. While all smoke detectors have a test button installed to ensure they are working, if one appears to be malfunctioning, a smoke detector tester can help you determine for sure. This is a type of aerosol that causes the detector to go off as if it detected smoke. Costs start at $20. Most smoke detectors are available today with several features to choose from. These include a silence button or remote-control silencer, battery backup, and a low-battery warning light. The NFPA recommends that homes have both ionization and visual detection systems in place. Any unit will have a low-battery indicator that will beep when the battery gets low. Many states have laws stating where and how many smoke detectors are required. Most require at least one per home. Always check the battery to make sure it is not dead before buying a new detector or other parts. Smoke detectors should be changed roughly every 10 years. Some fire stations will install free or low-cost smoke alarms. Some programs are for anyone, while others are aimed at the elderly, those with children, or recent immigrants. Every state or town has specific regulations for how far smoke detectors should be from one another, but it is generally recommended that there be at least one per floor, one per sleeping room, and one outside each sleeping area. The average cost to have a smoke detector hardwired into your home is around $150. Yes, electricians install smoke alarms that are hardwired or interconnected. Where is the best place to put a smoke detector in a bedroom? Should you put a smoke detector in the garage? Yes, it is recommended that you place a smoke detector in the garage. Should you put a smoke detector in the laundry room? How far should a smoke detector be from a vent? Smoke detectors should be a minimum of 12 inches from a vent, farther if possible to avoid disruption of smoke. Do smoke detectors need to be hardwired? How much does it cost to install a smoke detector in my city? Cost to install a smoke detector varies greatly by region (and even by zip code). To get free estimates from local contractors, please indicate yours.